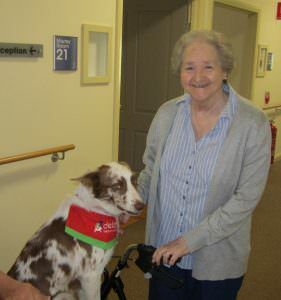 Residents at our Albury & District home have recently made a new friend, with Zorro the Delta Dog coming to visit on Monday afternoons. We have adopted the Delta Dog program to help enhance the lives of our residents who are living with dementia, giving them a friendly companion to chat with, and a furry paw to shake. From observing the meaningful interactions with Zorro (and the ear-to-ear smiles that can be seen around the home), it’s been clear that he has helped bring up some treasured memories for members of our community.